Victoria (recorded at Abbatiale de Payerne in Switzerland). 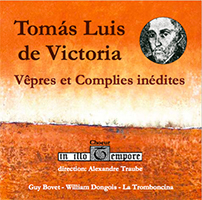 The disk set features unpublished works by the greatest Spanish Renaissance composer Tomás Luis de Victoria (1548-1611). The recording recreates the original context of the evening services of vespers and compline in early seventeenth-century Rome, in which these songs were performed. The works shed new light on these choral practices, in particular due to Victoria’s falsibordoni – the polyphonic declamation of a text immortalised by Allegri’s famous Miserere.